Buying the right comforter sets can be daunting especially if you are doing it for the first time. You will need to look at several things to avoid being duped or buying the wrong type. You may discover that it doesn’t match your surroundings, the material/fabric scratches or tears easily, or it is too light to too heavy. Additionally, the wrong product may not have excellent breathability, and this will make you or any other user sweat too much due to a stuffy environment, it may have an unpleasant factory smell, or may develop odor over time. Anyway, why should you struggle when you can simply depend on reviews that focus on the main elements and thereafter list the best products that are available? To give a helping hand on this issue, our team has briefly reviewed the top 10 best comforter sets which you can easily find on the market in 2019. We begin with the Downluxe Lightweight Comforter Set which is designed for Queen Beds. It is very stylish and will look marvelous on most beds and beddings and also blends well with most decors whether traditional or modern. And considering its reversible, you can always change its looks depending on your mood or the type of appeal you desire. The stylish piece has a good dimension of 88 x 92 inches and provides full coverage on the bed and the user too. It comprises a warm and cozy 100% brushed microfiber that provides good warmth even when it’s cold. The unit also comes with 2 sham pillows, each measuring 20 x 26 inches to complete the set. Furthermore, all the pieces are hypoallergenic, and cases of allergies or side effects are unlikely. And thanks to the 2-inch flange on the pillows and the printed design, they will make the room livelier. Next, we have this set from Comfy Bedding. The Queen size set comprises 5 pieces: 1 comforter, 1 square ornamental pillow, 1 rectangular decorative pillow and 2 standard pillowcases. With all these pieces, you won’t need to go searching for additional units to complete the bedding or worry about mismatched decor. They are all made of 100% microfiber cover that feels quite soft and smooth even on the naked skin. Furthermore, they also have an amazing design to improve the elegance in the room and are strongly stitched to prevent the seams from coming apart during the use. The Jacquard microfiber brings out a warm and bright appeal into the room whereas the hypoallergenic fillings ensure you or any other user stays safe during use. What’s more, the set doesn’t have a strong factory smell and has good breathability for excellent air circulation and to prevent a stuffy surrounding. The Comfort Spaces Dixie mini set is not only fashionable but also very versatile. It boasts of geometrical pattern stitching that gives it a unique and classy appeal that will go well with different settings. Furthermore, its good versatility makes it appropriate for separate bedrooms as well as home styling, both modern and traditional. 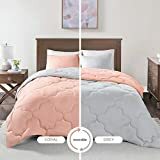 The set consists of 1 comforter measuring 90(L) x 66()W) inches and 1 pillow that measures 26(L) x 20(W) inches to fit on a twin or twin XL bed and has Gray and Coral colors. All the pieces are made of a warm down for maximum warmth and have a soft finish for extra comfort. They are well-stitched to prevent ripping and also vacuum sealed to protect the fillings. And on top of that, you can vary the mood or appeal in the bedroom by simply reversing the items since any side can be used. Your bedroom will surely look warm and cozy with the Madison Park Amherst comforter set which is appropriate for Queen Bed. 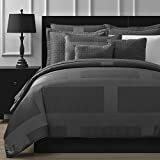 The complete unit features 7 pieces that include 1 Comforter, 3 Decorative Pillows, and 2 Standard Shams and1 Bed Skirt and you, therefore, won’t need to purchase any additional item to make the bed fully functional. They all are made of 100% polyester fabric for dependability and warmth and the 100% polyester fillings provide good comfort for a good might sleeping or a relaxing day nap. Furthermore, they are very colorful and stylish courtesy of their range of colors and striped design and are thus fit for any bedroom. The 90 x 90-inch comforter has a nice dimension to fully protect you from the cold and increase the satisfaction, whereas the pillows give you a nice comfortable platform to place your head. If your bedroom needs a quick makeover or you want to experience better comfort and satisfaction, then it’s probably time you owned a good comforter set. How about you choose the Comfort Spaces Coco Twin Comforter Set? It consists of 1 relatively large comforter that measures 90(L) x 66(W) inches, 1 Decorative pillow measuring 16(L) x 12(W), and 1 Sham measuring 26(L) x 20(W) inches. With all these pieces, your sleeping area will be fully functional and guarantee you of good night sleep. 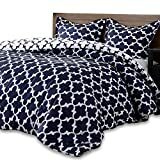 The trendy pieces feature damask pattern prints to complement any bedroom setting and come in a nice black and white color. This set is good for Twin or Twin XL bed and consists of a vacuum sealing to secure the fillings and also for long-lasting performance. According to consumers, this product is worth buying because of its lightweight, amazing comfort, easy washing, and affordability. You don’t have to break the bank to own a beautiful comforter set for your bedroom. With the Sleep Restoration Micro mink, not only do you get better sleep but also transform the bedroom experience. The Goose down Alternative set is suitable for the home, hotel, holiday home, and many other places. Furthermore, it has a nice pattern and design to blend with most bedroom decors, fitting, and furniture. The high quality assures you of maximum comfort and durable service whereas the good dimension keeps you and/ or the other user well covered. It is fit for a Full or Queen Bed and is made of hypoallergenic material and fillings to stop any side effects or allergies. And if you worry about feeling cold particularly in the cold season or feeling stuffy in the hot months, then you should not worry because it’s appropriate for all seasons. The Madison Park brand is a leader in regards to comforters, beddings and related accessories. Its prowess is seen in their high-quality products such as this one which is appropriate for Queen Size bed. The Palmer set consists of 7 pieces (1 Comforter, 1 Bed Skirt, 3 Decorative Pillows, and 2 Shams) for an entirely fictional experience and they are all made of pieced microsuede for a warm, cozy effect. The ivory comforter has a soft feel that improves the experience and allows you to sleep for more hours with minimal tossing and turning. Furthermore, it features a nice fabric that doesn’t wrinkle even after washing and this provides a smooth surface. The breathable fabric has good ventilation to keep you cool particularly in warm or the hot summer days while the durable fabric and design assure you of many years of use. The easy-care set can be machine washed with cold water and dries fairly fast for use within a shorter time. Consisting of a comforter measuring 88(L) x 88(W) inches and 2 pillow shams each measuring 26(L) x 20(W) inches, the Utopia Bedding Comforter Set will help you attain better sleep quality. It has a beautiful design and comes in a grey color to match most bedrooms and furniture in the modern home. It is perfect for a queen bed and a boost of luxurious, soft brushed Microfiber that feels ultra smooth to the body. Furthermore, its good breathability prevents you from sweating too much whereas the 2 inches flange on the pillow enhances its beautiful looks. And to prevent ripping or tearing, the pieces feature strong weaving and stitching which works well with the 100% polyester construction. The 3D hollow Siliconized filling not only offers good support but is also very comfortable and this also prevents aches and fatigue since it conforms to the body’s contours. Coming in a pure Grey/Black color, the Dovedote Reversible Comforter set is what you probably are seeking. It looks great in most bedrooms thanks to its simple yet elegant design and also comes in a nice dimension for everyday application. The lightweight and warm comforter measures 90(L) x 88(W) inches and fits nicely on a queen bed. Each of the 2 standard pillow shams is 26(L) x 20(W) inches and go well with the comforter as well as any bedroom setting. In addition, the neutral tones that are created by the black and gray color will look nice in a modern or traditionally styled home and since you can reverse the sides, then you have the option of changing the look. It is an All Season comforter meaning that you can use it in any season and still achieve the best looks not forgetting maximum satisfaction. Finally, we review the Madison Park Dawn Queen bed and comforter set which also happens to be the top-ranked item on this list. It features a trendy appearance to improve the bedroom appeal as well as make the bedroom more inviting. 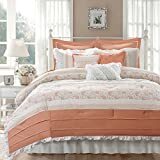 The versatile item has 9 pieces in total; 1 Comforter (90×90-inch), 3 pillows (16×16, 12×18, 18×20 inch) 2 Standard Shams (20×26-inch), 2 euro shams (26×26-inch), and 1-bed skirt (60×80-inch). The polyester material is both strong and durable and also feels super smooth on the body. Furthermore, the 100% polyester filling provides a comfy and warm platform to improve the sleep quality. The pieces have good ventilation to keep you cool when it’s hot and also provide the right warmth in the cold days. And to give the bedroom a chic and cool look, the set comprises a floral shabby pattern and coral color. It is true that finding a good comforter set has its challenges. You may not know what will match your interior décor and furniture; you may not be aware of the latest trends or the most fashionable pieces and also may pay a high fee for a substandard product. Additionally, you need to focus on the color, weight, material/fabric, thread count, price and much more. Fortunately for you, we have spent quite some time looking at the available options and have unearthed the best products that are worth buying. 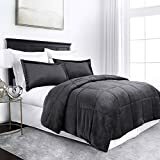 We went for highly rated products, comforters with many reviews, and also preferred those that came from well established and reputable companies. Therefore, you won’t worry about quality, reliability, elegance, and dependability when using any of the above comforter sets. Choose the best for a fantastic experience! Productsbrowser.com is a participant in the Amazon Services LLC Associates Program, an affiliate advertising program designed to provide a means for us to earn fees by linking to Amazon.com and affiliated sites.